Organizations or teams that run multiple smaller-scale projects. Organizations that don’t have to follow formal project management methodology. Informal projects that don’t require much monitoring. And don’t worry if you haven’t seen anything called Tasks in SharePoint for project management just yet. Follow this link from Microsoft Support and get it set up quickly. Those with a project management mindset are fond of well-designed timeline bars and easy-to-understand Gantt charts, both of which are great to take snapshots of for quick team progress updates. 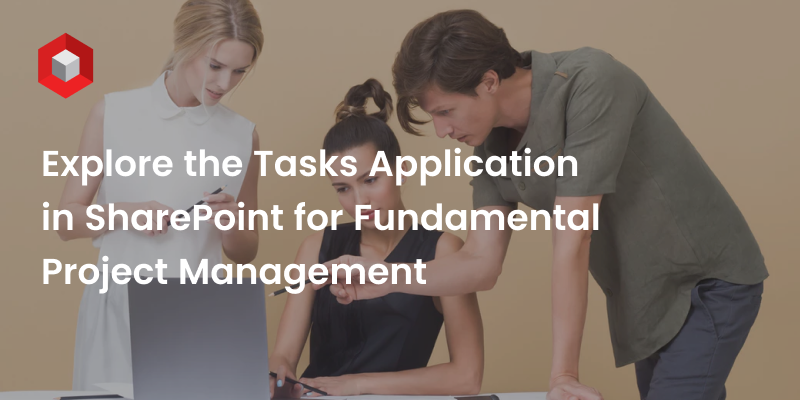 The Tasks app in SharePoint was built with the same philosophy in mind; with a thoughtful interface and efficiency-focused functions, Tasks proves to be a simple yet useful app for fundamental project management. Make your first task by adding it to the list in the center of the page. Note the task’s name in the appropriate column, then fill in its due date and to whom it is assigned. Repeat these steps with any tasks in your project, then you’re done! All data is immediately shown both in the list and on the top timeline bar. You can also add (or delete) any columns you want, such as priority level, task status, percentage of completion, and description of the task. So go ahead and customize your own table; the app was made for your convenience in project management, after all! When you finish your list, click “stop editing,” and click “edit” whenever you want to make further changes. As a user familiar with project management tools, you may know already that single-level task management is never enough, as it is often disorganized and can be difficult to use when tracking progress. The Tasks app, on the other hand, lets you create multiple levels of tasks using subtasks for better project management. Add subtasks right under a task and hide/collapse subtasks with one single click, making your list look neat and clean all the time. Timelines are essential for any project plan, and often more than one is necessary to get the job done. With the Tasks app, you can make timelines for multiple purposes so you are not limited to just one for the entire project. Make a timeline for groups of specific actions, such as all of the reviewing tasks. You can also add a timeline for each specialized section of the project, such as marketing or finance. With just a few mouse clicks and drags, SharePoint’s Tasks app can bring smart, visually engaging project management to your team. During an on-going project, timing is vital. With this in mind, the Tasks app allows you to view a task’s status, such as if it is late, when its due date may be, or when it was completed. With this feature, you can make sure everything is under control and help minimize unexpected situations. It is essential to set milestones that team members can aim to meet during a project. To remind your team of important upcoming days, you can select which tasks in the list to appear on a timeline. It is a visual way to help members stay focused on crucial events that you don’t want to miss. If you need notifications regarding changes from your list or to help alert your team about the next deadline, you should try the Alert feature in Tasks. This function emails or texts all of the selected team members (including the sender) about critical tasks. And don’t worry about being annoyed by frequent alerts; let the feature serve you best by picking the frequency of the updates you prefer to receive. Every project comes to a close, and it is at this point that you cross out all tasks on your list. However, before you throw a party to celebrate, make sure all of the project’s reports are stored, statistics are filled, deliverables are completed, and contracts are signed off. To do all of this, you may need a smart tool to arrange and manage your project’s files efficiently. Luckily, SharePoint’s Tasks app can help by attaching documents, libraries, and/or wiki pages to tasks in your list for easy access and review. Not totally convinced of the power of SharePoint yet? Why not take a further look here about why you should create a SharePoint site for your project with NIFTIT? Or, if you are simply tired of reading about it and want to test it yourself, then spare a minute to leave us your contact information in order to receive an Office 365 FREE trial with SharePoint. images are broken. can you please check ?